Hello Nosh Show listeners! It's time to delve in to the minds of four snackers who travel the crazy world of artificial flavors, sweeteners and preservatives among other things. 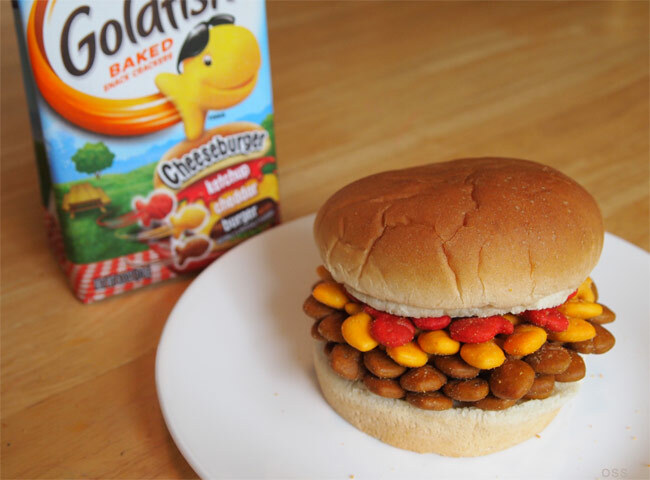 Now what could be more crazy than cheeseburger goldfish? They're nothing I would ever pick up on my own because I still don't get meat flavored snacks, but I'm going to take one for the team here. On Episode 55 I do share my thoughts on Pepperidge Farm's bizarre creation. Yes, they smell likes burgers and yes they taste like burgers, but why would I want these? And it was really hard to wash the smell off my hands when I was done prepping the photo above.... I guess this doesn't count as thinking "outside the bun". I'm having trouble eating more than a few and the smell has been driving me nuts. I tried to explain it to Eric but it only made him more interested to try them. Open a bag and you'll know what I mean.... but will you dare? and where do we go from here? mix in a few green colored pickle goldfish? hot dog goldfish maybe? I'm deaf :( and wondering what was the verdict of the cheeseburger goldfish? Weird, just weird. It's not that they didnt get a decent representation of the flavor, I just cant process the idea behind goldfish that reek of burger smell. I couldn't agree more. Can't stand it when snack companies try and transform snacks into "meals." Particularly, meat-centered meals.